We reaffirm the inerrant Scripture to be the sole source of written divine revelation, which alone can bind the conscience. The Bible alone teaches all that is necessary for our salvation from sin and is the standard by which all that is necessary for our salvation from sin and is the standard by which all Christian behavior must be measured. Christian behavior must be measured. We deny that any creed, council or individual may bind a Christian’s conscience, that the Holy Spirit speaks independently of or contrary to what is set forth in the Bible, or that personal spiritual experience can ever be a vehicle of revelation. The Reformation was at its core a fight to get back to the Bible and discard a plethora of manmade doctrines and traditions which had been increasing over the years in the Church. At this point it is helpful to begin by defining our terms so that we understand how the following term “doctrine” is being used. Doctrine simply means “teaching.” The question before us is what is the source of the teaching we are adhering to? It is important for us to always remember that according to the Bible there are only three sources of doctrine impacting our lives at any time. Hopefully we are building our lives on the doctrine of God. 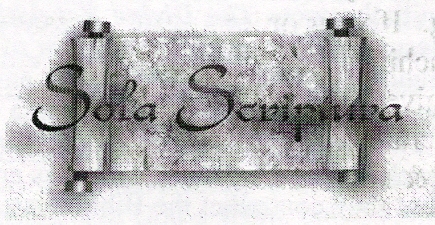 From the inception of the Church, various false teachers, false prophets and false apostles have tried to supplant the authority of Scripture by adding their own teachings and practices in an attempt to gain power over the spiritual lives of God’s people and to destroy the foundational doctrine of Sola Scriptura. Expressly is used only once in the entire New Testament and here we read of the Holy Spirit stating unequivocally that in the latter times some people shall depart or fall away from the true faith in Christ and His work alone. What causes this apostasy? These individuals give heed to seducing spirits and doctrines of devils, that word can also be translated as demons. How do demons teach? Obviously they speak through people who are open to them. The examples that Paul cites specifically are doctrines of devils. The first one is the doctrine which forbids marriage. To this day the Roman Catholic Church forbids both its priests and nuns to enter into marriage. The Shaker cult forbade their members to marry and demanded people get divorced who joined their ranks. Other sundry cults and sects have also forbidden marriage among its members. The Bible clearly denotes this as a doctrine of devils. The other area Paul cites concerns dietary regulations. For many years the Roman Catholic Church forbid people to eat meat on Friday (I am not sure if this practice is still being enforced). Many other groups demand strict vegetarianism and some “Hebrew” roots cults demand strict dietary adherence. Obviously, Hasidic and Orthodox Jews still keep the Old Covenant dietary laws too. Any group that demands that their members abstain from eating anything that God has created to be enjoyed is promulgating a doctrine of devils. Martin Luther (1483 – 1546) is to be given the credit for inventing the false doctrine of Sola Scriptura (Bible Only or Bible Sufficiency). He had separated himself from the authority of the Papacy and the Magisterium, and thereby so doing lost all authority regarding Church matters. He then turned to the Bible, a book as the sole source of authority. Can a book ever be a sole source of authority? This article is not about Martin Luther nor is it a polemic against Roman Catholicism (RC) as a religion. What is important to notice is that even to this day RC upholds its traditions as equal in authority with the bible and when the Bible and tradition do not agree it seems that manmade doctrines and those of demons prevail. Let me cite just a few extra-biblical traditions concerning the Virgin Mary within the R.C.C. These are taken directly from their own catechism in use today. There is nothing scripturally to base this claim upon. The Bible speaks of Enoch being taken up and Elijah riding off to heaven in a chariot of fire but no mention is made concerning much at all about the life or death of Mary after the resurrection of Jesus. The entire cult of Mary within the R.C.C. is an abomination and a blasphemy. These are not minor issues that we can agree to disagree about. Teaching that Mary played a vital role in our redemption is teaching a doctrine of devils; one which reduces the centrality of Jesus Christ, as the Lamb of God who alone bore the sin of the world. These are only some examples of non-biblical traditions that the R.C.C. practices, such as the infallibility of the Pope when he makes declarations from “Peters” seat in the Vatican. Or the belief in purgatory where the partially saved sinner goes to have the rest of their sins purged away by fire. Not the mention the practice of indulgences which are still being given. It is easy to understand why the R.C.C. took such a violent stance against Luther and all those reformers who followed him. The R.C.C. knew that if the Bible ever got into the hands of the “common man” in a language they could read and understand that the R.C.C. would lose the stranglehold it had on the souls of millions of people. The printing of the Bible by Guttenberg in German and Luther pointing people to the Bible as the only rule for faith and practice shook the very foundations of the R.C.C. God has revealed Himself to us through His Word and He has given us the Bible as the only concrete source by which we are to measure every spiritual experience, doctrine and practice. The Word of god is an unwavering arbiter on all matters concerning the life of faith. 6. What argument do the Scriptures themselves afford in favor of the doctrine that they are the only infallible rule of faith? 2nd Christ and his apostles always refer to the written Scriptures, then existing, as authority, and to no other rule of faith whatsoever. (Luke 16:29; 10:26; John 5:39; Rom. 4:3; 2Tim 3:15). 3rd The Bereans are commended for bringing all questions, even apostolic teaching, to this test. (Acts 17:11; see also Isa. 8:16). 4th. Christ rebukes the Pharisees for adding to and perverting the Scriptures (Matt. 15:7-9; Mark 7:5-8; see also Rev. 22:18, 19, and Deut. 4:2; 12:32 Josh 1:7. 1st That the Scriptures are the only infallible rule of faith and practice. 2nd (1) Negatively. That there is no body of men who are either qualified, or authorized, to interpret the Scriptures, or apply their principles to the decision of particular questions, in a sense binding upon the faith of their fellow Christians. Not only is the R.C.C. (and some mainline Protestant denomination) guilty of violating the above texts so is every “Bible-based” cult. Many within the charismatic movement directly violate the above Scriptures also. I have already mentioned several examples in the R.C.C. so I will briefly mention some examples in a few of the cult groups. The Unification Church of the Holy Spirit, aka the “Moonies” have supplanted the bible with Mr. Moon’s revelation called “The Divine Principle.” The Church of Jesus Christ of Latter Day Saints, aka The Mormons, although using the Bible, their main focus of faith and practice is found in “The Book of Mormon,” “The Pearl of Great Price” and “Doctrines and Covenants.” The Jehovah’s Witnesses have their own perversion of the Bible called “The New World Translation” which has been highly redacted to support their ungodly beliefs. The Children of God (now called the Family of Love) uses the “Mo Letters” as their guide. The Church of Christ Science, aka Christian Science, uses Mary Baker Eddy’s “Science and Health with Keys to the Scriptures.” The Christadelphians use “Key to Understanding the Bible.” All of these cults use the Bible but in reality have placed it below the interpretation and/or further revelations of the founders of the cult. The Bible is in no way the sole authority in any of these cult members lives. Methodist Church is one such mainline historic Protestant denominations who seek to be more politically correct and culturally relevant will also join the chorus of those whose fidelity is not to God but to the approval of fallen humanity. This “new” translation of the Bible is called “Today’s New International Version (TNIV) and is being published by the International Bible Society and is a revision of the NIV. The scholars (18) who examined this latest perversion of God’s Word were no spiritual lightweights nor were they supporters of the “King James Only” debate. Sola Scriptura implies having an accurate translation of the Scripture to begin with! This changing of God’s Word is very dangerous because it will mislead some people into thinking they are standing by the principle of Sola Scriptura, when it is not God’s Word, but man’s they are standing upon. The result will be disastrous for these peoples spiritual lives because they will discover that they have built their spiritual house upon sand and not the true rock of Jesus Christ, the Living Word (see Matthew 7:24-27). Earlier I mentioned just a few examples of R.C. traditions and doctrines which have taken away from the rightful authority of God’s Word, but within the Protestant Church there are many traditions and practices that also do not bow their knee to God’s Word as final arbiter either. I will cite just a few that I am personally knowledgeable with the fast growing and pervasive sign-gift movement. Although Pentecostal and Charismatic congregations pay lip service to adhering to Sola Scriptura in reality they do not. For example, virtually every Pentecostal and Charismatic Church teaches as dogma the experience of being slain in the spirit. (20) There is neither contextual biblical support for this teaching nor any valid biblical example for the experience. This teaching and practice is completely manmade. The same can be said of their definitions for the gift of the word of Knowledge and the gift of the word of wisdom (see 1 Cor. 12:8). The Bible never explains what these gifts were or how they manifested themselves in the life of the early church. The definition for these two gifts were restored to the Church by a man named Howard Carter, a Pentecostal evangelist who claimed God revealed them to him while he was in prison! (21) Mr. Carter also claimed to possess all nine of the sign-gifts. His definitions have become the accepted Pentecostal definitions from the sign-gifts. Over a million professing Christians flew into Toronto to receive the “new wine” of the Holy Spirit in the form of holy laughter, spiritual drunkenness, prophetic animal sounds and movements. (22) These so-called manifestations of the Holy Spirit spread rapidly around the world and are generally accepted as being valid demonstrations of God’s power in the midst of His people, Even though there is not one shred of biblical support for any of these spiritual enthusiasms. There answer is that what is occurring now in their revivals (I also failed to mention the alleged manifestations of gold teeth, gold dust, angel feathers and jewels being manifested in revival services) are simply part of what Jesus did in His earthly ministry but are not recorded in the biblical text. That response is extremely troubling because if one takes that approach to the Bible then you can allow anything to take place and point to John 21:25 as ones biblical support. This type of response impugns the sufficiency of Scripture. To hold to such a position is to say that God left out things (such as these manifestations) which are needful for Christian growth and a closer more dynamic fellowship with God. The secondary response given is “look at the good fruit being brought forth in the individuals lives.” Having been totally enmeshed in charismatic extremism for many years I can honestly say that I have yet to see any benefits from these practices in individuals’ lives or that of congregations that have embraced such practices. In fact, I’ve noted quite the opposite in those participating in practices not endorsed by God’s Word. Our ministry produced a book entitled “Fruit Proof,” which is over 100 pages long and consists of eyewitness accounts given by Pentecostal and sign-gift believers who went to revival services to get the “new wine” of the Holy Spirit and instead left oppressed and disheartened. Many congregations have literally been split and the sheep scattered when the local church leaders brought in these new gifts, which turned out to be curses. Good fruit is at best subjective. The Moonie, Mormon or Mohammedan can point to members in their groups whose lives have been transformed by their embracing of the cult or false religions demands. But evil men and seducers shall wax worse and worse, deceiving and being deceived. But continue thou in the things which thou hast learned and hast been assured of, knowing of whom thou hast learned [them]: And that from a child thou hast known the holy scriptures, which are able to make thee wise unto salvation through faith which is in Christ Jesus. All scripture [is] given by inspiration of God, and [is] profitable for doctrine, for reproof, for correction for instruction in righteousness: That the man of God may be perfect, thoroughly furnished unto all good works. I charge [thee] therefore before God, and the Lord Jesus Christ, who shall judge the quick and the dead at his appearing and his kingdom; Preach the word; be instant in season, out of season; reprove, rebuke, exhort with all longsuffering and doctrine. For the time will come when they will not endure sound doctrine; but after their own lust shall they heap to themselves teachers, having itching ears; And they shall turn away [their] ears from the truth, and shall be turned unto fables. 2 Timothy 3:13,14. The largest church in America is the Lakewood Church in Dallas led by Joel Osteen (you might remember him from a couple of issues ago). Joel stated in the article in Charisma magazine that people are not interested in theology…the knowledge of God. Thirty thousand people with itching ears and a “pastor” who can’t wait to scratch them. Teachers abound on both radio and television proclaiming damnable heresies and due to the biblical illiteracy of believers in the Church “many” follow their heretical teachings. Due to the heretics and those who follow them true orthodox Christianity will be (and is) spoken evil of by those outside the faith. All one must do is look back to the scandals of the 1980’s when the PTL scandal was revealed and Jim Bakker was shown to be immoral, then came revelations about Mr. Robert Tilton, Peter Popoff, Larry Lea, Jimmy Swaggart and W.V. Grant. Now recently we learned that Paul Cain is a homosexual and alcoholic and that Paul Crouch, President of TBN, may also have been engaged in homosexual activity. The various healing frauds, often lead to the death of their followers. They have perpetrated false promises on God’s gullible sheep. Over the years, people like Oral Roberts, Kathryn Kuhlman, A.A. Allen, Hobart Freeman, Jack Coe, William Branham and of course, Mr. Benny Hinn have peddled false hopes and produced no documented miracles. All of these people have literally made merchandise out of the people of God and over the years bilking them out of over a billion dollars! Some may say that I have set up a straw-man argument by citing the more notorious peddlers of God’s Word, but this is not the case. All of the above mentioned individual are (or were) leaders within Pentecostalism and the Charismatic Renewal. These people are the “giants’ of this brand of belief and trust me when I say the fruit does not fall from the tree regarding these leaders. Mary K. Baxter initially wrote The Divine Revelation of Hell in which she says that Jesus took her on a personal tour of hell for 40 days. That book sold hundreds of thousands of copies and is now in several languages. People bought into her folly to such a degree Mrs. Baxter went on to pen The Divine Revelation of Heaven and most recently The Divine Revelation of Glory. These books are filled not only with outright lies but they contradict the Bible numerous times. Yet because of her alleged vision and experience she has gained an international following and is seen by many as an expert of the heavenly and hellish realms. Jessie Duplantis wrote Heaven, Close Encounters of the god Kind, another international best selling book, available in 99% of the Christian bookstores. In his book Jessie denies he complete atoning work of the cross (we have to do some additional works when we get to heaven in order to perfect ourselves). He denies the sufficiency of Scripture and denies its infallibility not to mention teaching pre-incarnation human souls, heaven as a literal planet and a whole host of error and even blasphemy. Yet Mr. Duplantis is a regular teacher on TBN and travels world ide sharing his vision and other Word of Faith heresies. These are just two examples of people who’ve based much of their ministry on their alleged encounters in the unseen realm; I could cite a dozen more people. My point is simply to demonstrate what occurs when people place their faith in anything or anyone, no matter how persuasive they may be, outside of the Bible. 5. Liichow, Robert Blessing or Judgment goes into great detail examining the charismatic Shaker cult and is an excellent resource for any Christian to have who is interested in knowing the origin of today’s revival manifestations. 12. Pope Pius XII, Ad Coeli Reginam Underlining added for emphasis. 14. Ibid p. 17 Underlining added for emphasis. 18. The 26 scholars who have stated their refusal to endorse the TNIV include two Southern Baptist Convention seminary presidents. R. Albert Mohler. Jr. of Southern Baptist Theological Semiary and Paige Patterson of South-eastern Baptist Theological Seminary, along with Wayne Grudem of Phoenix Seminary in Scottsdale, Ariz, and a past president of the Evangelical Theological Society; Harold O.J. Brown of Reformed Theological Seminary; R.C. Sproul of Ligonier Ministries; John Piper, Bethlehem Baptist Church in Minneapolis, and Raymond C. Orlund Jr. of First Presbyterian Church, Augusta, Ga.
19. I prefer to use the term “sign-gift movement” versus the more common phrase “charismatic movement,” when referring to the larger group because all of God’s people are charismatic in that we have all been gifted by the Holy Spirit with differing gifts. 20. DMI offers the only book in print (to our knowledge) that deals exclusively with this and the other practices cited in this article. These books can be purchased from our web site. 23. Robertson’s Word Pictures reference obtained from Bibleworks for windows, release ver. 1999 software. 24. Tommy Tenney wrote the “God Chasers” which became a small industry with follow-up books, tapes, tee-shirts, devotional guides, etc. Few Christians seemed to mind that Tenney is a Oneness Pentecostal who denies the Trinity, believes in salvation through water Baptism in Jesus name only. He can be seen on a regular basis on TBN. 25. Rick Warren has written several books around the theme of being “purpose driven” and these books have also spawned an industry around them. Many struggling churches think using his curriculum will be their salvation and result in a population explosion. 26. Wilkins, Todd Issues, Etc. Journal Vol. 3, No. 3, 2004, p. 4 underlining added for emphasis.